Minister of Tourism, Hon. 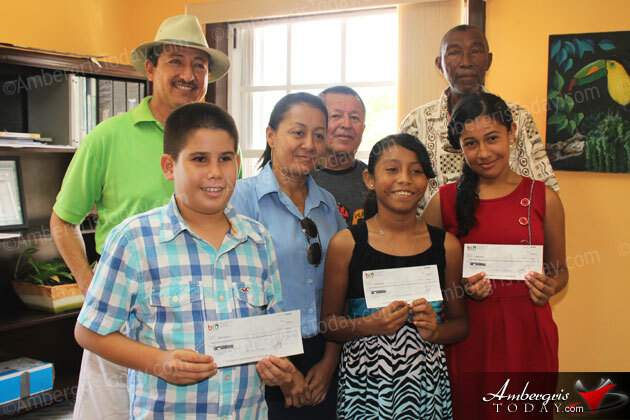 Manuel Heredia Jr. and Mayor of San Pedro Town Daniel Guerrero presented checks to the Top PSE scorers of San Pedro and Caye Caulker as recognition for their excellent results on the examination. In a short, yet meaningful, ceremony Minister Heredia congratulated the students for their hard work and dedication. He stated that the money given to them was a form of acknowledgment for their excellent work in the Primary School Examination. Chelsea Zetina of San Pedro RC School was presented with a plaque by the Mayor for achieving a perfect score in Mathematics in the PSE. She also received $350 from the Belize Tourism Board. Jenessa Sierra of San Pedro RC School achieved the highest score for the school and the second highest countrywide. Matthew Sandoval of Caye Caulker RC School obtained the highest PSE score for his school; both Jenessa and Matthew received $500. Also present at the ceremony were the proud parents of the students, Principal Roxani Kay of San Pedro RC School and Chairman of Caye Caulker Wayne Miller.